He was the son of John James Kirk and Mary Ann Moulds. Death 15 November 1932 Samuel Edward Kirk died on Tuesday, 15 November 1932 at Petersham, NSW, AustraliaG, at age 57. [S2] Index of BDM records, NSW BDM, Registration - Place: Parramatta; Year: 1875; Number: 17341. He was the son of Simon Moulds and Sarah Jane Kirk. Marriage 5 March 1894 Simon James was married to Ada Elizabeth King, daughter of William King and Mary Unknown, on Monday, 5 March 1894 at All Saints Church of England, Parramatta, NSW, AustraliaG. [S2] Index of BDM records, NSW BDM, Registration - Place: Parramatta; Year: 1863; Number: 11703. Birth 1873 Ada Elizabeth King was born in 1873 at Maitland, NSW, AustraliaG. She was the daughter of William King and Mary Unknown. Marriage 5 March 1894 Ada Elizabeth was married to Simon James Moulds, son of Simon Moulds and Sarah Jane Kirk, on Monday, 5 March 1894 at All Saints Church of England, Parramatta, NSW, AustraliaG. Death 9 February 1895 Ada Elizabeth King died on Saturday, 9 February 1895 at Parramatta, NSW, AustraliaG. Married Name 1894 As of 5 March 1894, her married name was Moulds. Birth 24 November 1864 George Henry Moulds was born on Thursday, 24 November 1864 at North Colah, NSW, AustraliaG. Marriage 27 February 1901 George Henry was married to Ada May Baker on Wednesday, 27 February 1901 at All Saints Church of England, Parramatta, NSW, AustraliaG. Birth 1881 Ada May Baker was born in 1881. Marriage 27 February 1901 Ada May was married to George Henry Moulds, son of Simon Moulds and Sarah Jane Kirk, on Wednesday, 27 February 1901 at All Saints Church of England, Parramatta, NSW, AustraliaG. Married Name 1901 As of 27 February 1901, her married name was Moulds. Birth 23 May 1866 Sarah Ann Moulds was born on Wednesday, 23 May 1866. She was the daughter of Simon Moulds and Sarah Jane Kirk. Death 17 April 1875 Sarah Ann Moulds died on Saturday, 17 April 1875 at age 8. Birth 2 November 1867 Mary Susannah Moulds was born on Saturday, 2 November 1867 at Dural, NSW, AustraliaG. Birth 11 August 1880 Rosetta Elizabeth Moulds was born on Wednesday, 11 August 1880 at Colo, NSW, AustraliaG. She was the daughter of Simon Moulds and Susannah Taylor. Married Name 1900 As of 30 July 1900, her married name was Scott. He was the son of Simon Moulds and Susannah Taylor. Death 11 December 1960 Edward John Moulds died on Sunday, 11 December 1960 at NSW, AustraliaG, at age 79. [S2] Index of BDM records, NSW BDM, Registration - Place: Central Cumberland; Year: 1881; Number: 14038. [S2] Index of BDM records, NSW BDM, Registration - Place: Central Cumberland; Year: 1883; Number: 15170. Birth 7 December 1884 Martha Rebecca Moulds was born on Sunday, 7 December 1884 at Dural, NSW, AustraliaG. Marriage 3 March 1904 Martha Rebecca was married to Godfrey J Scott on Thursday, 3 March 1904 at St Pauls Church, Castle Hill, NSW, AustraliaG. Married Name 1904 As of 3 March 1904, her married name was Scott. Birth 27 February 1886 William Henry Moulds was born on Saturday, 27 February 1886 at Colo, NSW, AustraliaG. [S2] Index of BDM records, NSW BDM, Place of Registration: Chatswood; Year: 1920; Number: 12333. Birth 23 October 1887 He was born on Sunday, 23 October 1887. Birth 11 July 1889 He was born on Thursday, 11 July 1889. Married Name 1911 As of 1911, her married name was Merrick. [S2] Index of BDM records, NSW BDM, Registration - Place: Parramatta; Year: 1890; Number: 10459. Name Variation Hedley Moulds was also known as Edley as shown in his birth entry in the NSW BDM Index. As shown on his marriage entry in the NSW BDM Index. [S2] Index of BDM records, NSW BDM, Registration - Place: Parramatta; Year: 1892; Number: 10630. [S2] Index of BDM records, NSW BDM, Registration - Place: Parramatta; Year: 1894; Number: 26808. [S2] Index of BDM records, NSW BDM, Registration - Place: Redfern; Year: 1913; Number: 13272. [S2] Index of BDM records, NSW BDM, Registration - Place: Chatswood; Year: 1914; Number: 17219. [S74] Letter, Irene Olive Purnell to Robert Mote, 21 October 1999, page # 13. [S2] Index of BDM records, NSW BDM, Registration - Place: Swansea; Year: 1895; Number: 36740. [S2] Index of BDM records, NSW BDM, Registration - Place: Dunedoo; Year: 1917; Number: 11493. [S2] Index of BDM records, NSW BDM, Registration - Place: Dubbo; Year: 1918; Number: 29275. End-Line Susan Moulds has no known descendants. [S2] Index of BDM records, NSW BDM, Registration - Place: Castle Hill; Year: 1899; Number: 9008. [S2] Index of BDM records, NSW BDM, Registration - Place: Castle Hill; Year: 1899; Number: 11162. Birth 23 October 1886 Herbert John Wales was born on Saturday, 23 October 1886 at Young, NSW, AustraliaG. He was the son of Oliver Ambrose Wales and Margaret Wilson. 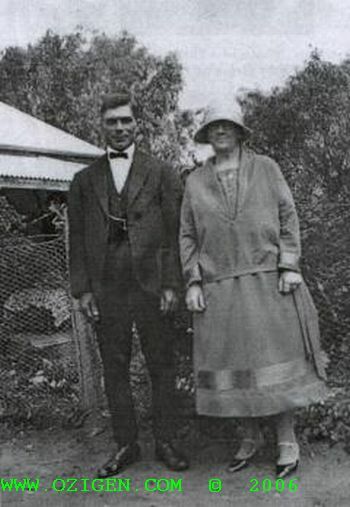 Marriage 1926 Herbert John was married to Mary Agnus Maher in 1926 at Murrumburrah, NSW, AustraliaG.